We all have brands that we look forward to seeing new releases from, and NTH (part of Janis Trading, as we all know) is one of those very brands. So, when Chris “Doc” Vail reached out and asked if we wanted to take a look at some of the newer models he’s releasing, we of course said yes. Victor will have a different one in a review soon, but I took a look at at the NTH Näcken Renegade. The NTH Näcken Renegade is, of course, and extension of the neo-modern Sub line that Vail has been putting together for awhile now. 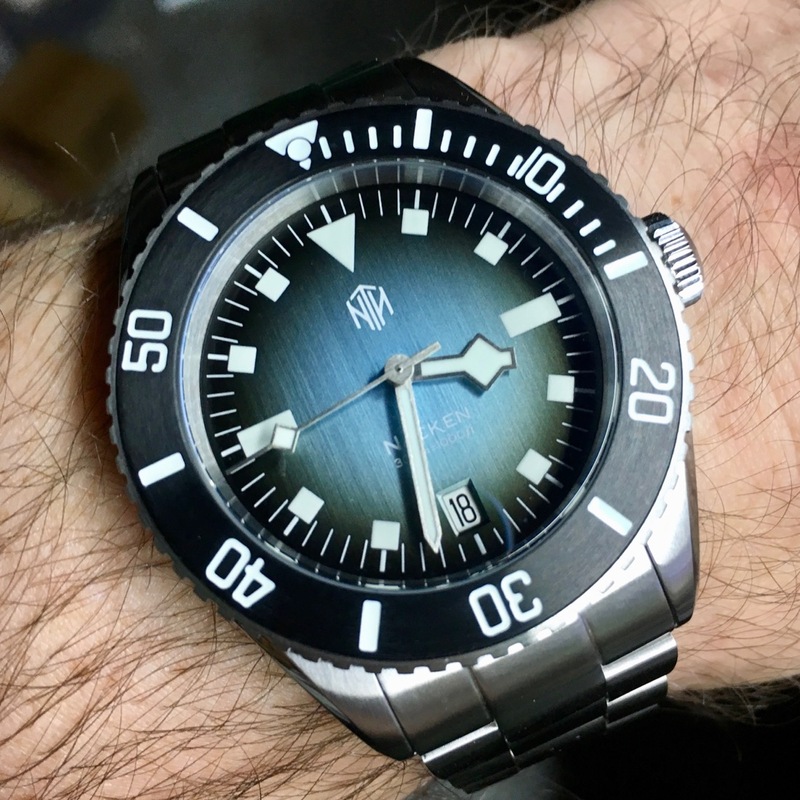 We’ve reviewed a handful of NTH watches (full list here) and Victor did an in-depth review of the Näcken line right here, including comparisons to the historical Rolex and Tudor designs that inspired these. Of particular note for this review would be the 1969 Tudor Submariner 7922 that he found a photo of – it looks a LOT like this watch. Of course, what drew me to the NTH Näcken Renegade was that blue gradient dial. Unlike others that you may have seen, this is done with a translucent color treatment on the dial, so you can still see the brushed finish marks on the (presumably) brass dial blank. This also means you have some shifting color, depending on the ambient light and the angle you’re holding it at. It can move from a deep blue to something with more than a little bit of a brownish tint to it. So, those in search of an opaque blue may not be pleased, but I found it to be an interesting effect (if tricky to photograph). Speaking of finishes and color on the NTH Näcken Renegade, I want to talk a little bit about the case and bracelet. On one hand, we’ve got a fairly “standard” brushed finish with polished bevel edges on the case. What I noticed when I was wearing the watch, however, was something unexpected. There’s a sort of bright luster that the metal has. It’s not so much reflective, but it is definitely bright. Made for a neat effect. Oh, and with the bracelet, there’s a bit of excitement around the links. Specifically, while it does have half-links, if they’re removed, the current full-size links won’t attach to the clasp. Vail is of course aware of this, and is working with the supplier right now to get that sorted out for the watches you may have landing on your wrist. Powering the NTH Näcken Renegade is the very familiar Miyota 9015 automatic movement, albeit with the date placed down at the 6 o’clock position, rather than at 3 or 4 (you can also opt for a non-date configuration as well). Normally, I’d ding a brand for not color-matching the date wheel, but here, the white disc works – it makes the date window feel like just another indice (though one that is slightly larger than the others). It wasn’t just the color and the interesting finish of the NTH Näcken Renegade that hooked me, though. Those were big parts of it, to be sure, but there is a lot going on here that just ticks the right boxes for me. You’ve got a compact stainless steel case (40mm by 11.5mm thick) with a sapphire crystal and a 300m WR rating, and of course the stock bracelet as well (which tapers from 20mm to 18mm). Add in the great lume on the dial (and the always-fun lumed crown), and there’s a lot to like. Once I had the bracelet of the NTH Näcken Renegade sized (my standard two links on each side, plus some fiddling with the spring bar in the clasp) it was ready to wear. And wear it I did. This was my primary watch when I went back to Detroit for Thanksgiving, and it has also made it’s way into the office. Dimensionally, this is a perfect watch for me, and the color scheme here is one of my favorites. Legibility is a snap in this color scheme, though I wouldn’t mind if the handset were just a touch larger. All in all, though, I did rather enjoy my time with the NTH Näcken Renegade. And my time with it further cemented the fact that I enjoy the snowflake hands so much more than the “Rolex” hands that we often see on subs. For anyone on the search for a compact dive watch with vintage looks and modern reliability, I don’t know how something like the $650 NTH Näcken Renegade wouldn’t be on the table. For those looking to purchase, you have a lot of options. We of course have the main product page linked at the end of this article, but there are also many authorized retailers both within and outside of the US – you can see that full list right here. Previous articleThe Outdoor Vitals LoftTek Adventure Jacket campaign closes today!